The primary source for information about early High Standard automatic pistols is Charles E. Petty’s 1976 book, High Standard Automatic Pistols, 1932-1950, which however can be supplemented by several recent on-line articles. I will provide a brief account of the early guns, leading up to the G .380, because I couldn’t find one on line and Petty’s book is becoming scarce and expensive. Carl Gustave “Gus” Swebelius immigrated to the United States from Sweden at the age of 17 in 1896. The son of a watchmaker, Swebelius went to work for the Marlin Firearms company in New Haven, Connecticut. He started out drilling barrels and advanced rapidly to department head and then designer. He worked on machine gun design during World War I and is said to have worked with John M. Browning on modifications to some of his designs. After the war he worked again for Marlin, and later for Winchester, as a designer. He founded his own company in 1926, in partnership with Gustave A. Beck, called the High Standard Manufacturing company Inc, to make drilling equipment. In 1932 he partnered with Beck and three other investors to buy the Hartford Arms Company, which manufactured a .22 target pistol. 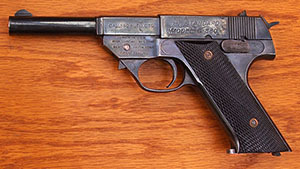 The Hartford Arms Model 1925 target pistol eventually became the High Standard Model B. Swebelius continued working for Winchester until 1939, when High Standard began to require his full-time attention. To discuss the origin of the High Standard design, we need to go back a few years and look at the Colt Automatic caliber .22 long rifle pistol which eventually became the Colt Woodsman (based on John M. Browning’s patent number 1276716, filed 30 March 1917), and the Hartford Model 1925 pistol which eventually became the High Standard Model B (based on Lucius M. Diehm’s patent number 1511510, filed 6 August 1921). It doesn’t take an expert to tell that these two pistols are very similar. Both guns have pivoting triggers, with an upward projection on the trigger that pulls the connector bar forward, engaging the sear to fire the gun. Both guns have internal hammers. Both guns have side plates on the left that cover the connector bar. Both guns have recoil springs built into the slide, and a button on top of the slide to lock the recoil spring in a retracted state. Both guns have short extractors on the right side. Both guns have an unlocked breech, fixed barrels, and slides that must be removed from the rear. The magazine of both guns has a protrusion on the right side allowing the follower to be pulled down to facilitate loading. The Colt’s trigger is tensioned by a small coil spring, whereas the Hartford/High Standard is tensioned by a spring and plunger that act against the upper projection of the trigger. Interestingly, however, Browning’s original patent shows a spring and plunger design to tension the trigger which was apparently not used in the production Colts. The Colt has a cleverly designed backstrap that can be removed (without tools) to release the slide (the top of the backstrap serves as the slide stop), whereas the Hartford/High Standard has a release lever in the frame which depresses an upright lever (tensioned by a spring and plunger) which serves as the backstop. At some point, the High Standard Model B’s backstop was redesigned to strengthen it, and the release lever location was moved from left to right. All future High Standard automatic pistols continued to use a nearly identical design. Every High Standard pistol ever made for commercial sale has an unlocked breech mechanism (i.e., was “blowback” operated). The Model C was identical to the slim-barreled Model B except chambered for the .22 Short. Production began 1 December 1936. The Model A was like the Model B, but had its grip length extended so the bottom of the grip was parallel with the top of the slide. This required a redesign of the magazine, but otherwise the majority of internal parts were interchangeable with those in the Model B. The first Model A was shipped 9 April 1938. The Model A was discontinued in 1942. The Model D shared the larger frame of the Model A, but had a heavier (medium weight) barrel. The first Model D was shipped 22 April 1938. It was discontinued in 1942. The Model E shared the larger frame of the Models A and D, but had the heaviest barrel of the three. As Charles E. Petty points out, today it would be called a ‘bull’ barrel. The Model E was the deluxe model and came with checkered walnut grips with a thumb rest. Production began 18 May 1938 and, like the Models A and D, the Model E was discontinued in 1942. The reason that the Models A, D, and E were all eliminated in 1942 is that they had been superceded by the external hammer H models, which were introduced in 1940, plus the U.S. had entered World War II and gun steel was at a premium. During World War II High Standard became the major supplier of target pistols to the U.S. military, which used them for training recruits. Apparently, the entire output of the company went to the military after the U.S. entered the war. The Models H-D and H-E were the first to appear and, as the names imply, they are simply a Model D or E with an external hammer. These guns appeared on 29 January 1940. Both the H-D and H-E have checkered walnut grips; the only difference being the weight of the barrel. The H-D proved to be the more popular product, so the H-E was dropped in 1942. According to Petty, the H-E is the rarest of the High Standard automatic pistols, barring prototypes, with only 1006 guns manufactured. The Model H-A, with the light barrel, was first shipped on 28 March 1940. The H-A was also discontinued in 1942, with only 1042 guns manufactured. The Model H-B, with the short grip, appeared on 13 May 1940. The original Model H-B, with a 4-1/2 inch barrel, was discontinued in 1942, with 2100 having been manufactured. The H-B was reissued in 1949 with either a 4-1/2 or a 6-3/4 inch barrel. 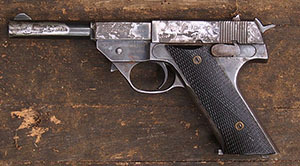 In mid 1942 the Model B was modified to become the Model B-US, with a minor change to the shape of the grip. Shipment to the government began on 8 September of that year. The U.S.A. Model H-D was an H-D with the addition of an external safety and fixed sights. After the war an adjustable sight was added to make the Model H-D Military, available in two barrel lengths, which was High Standard’s best-selling gun for nearly 20 years. Before the war ended High Standard also made over 2000 Model H-D pistols with integral suppressors for use by OSS agents and assassins, which were designated the U.S.A. Model HD-MS, though they were marked Model HD. Late in 1944, High Standard began development of a centerfire automatic pistol, under government contract. The intention was to make a suppressed pistol like the HD-MS chambered for various centerfire cartridges, including the .25 ACP, .32 ACP, .38 Special, .32 S&W Long, and 9mm Luger. A heavier frame was designed for the larger cartridges, based on the H-D, but with a removable barrel secured by a spring-loaded latch in front of the trigger guard. 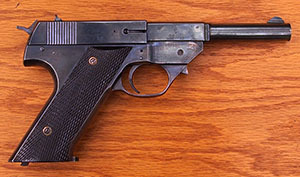 The removable barrel meant the breech -block/slide could be removed from the front of the pistol instead of the rear (a desirable safety feature), and the lever that allowed removal of the slide from the rear on the earlier pistols, as well as the spring-tensioned slide stop, could be eliminated. The war ended with only a single gun having been delivered to the OSS, and the government canceled the contract. 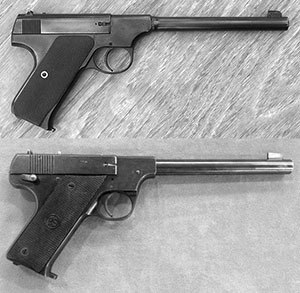 High Standard received a payout for work already done and had heavy frames that were already fabricated so they decided to use them to make a commercial pistol. The 38 Special and 9mm Luger cartridges had proven too powerful for an unlocked breech design, so the .380 ACP cartridge was chosen. According to Petty, production of the G .380 began late in 1947, with serial numbers beginning at 100 and running up to 7551. However, John Stimson, who has been gathering High Standard data for many years, says that the highest serial number was 7881 and that at least one gun is known with a serial number under 100. I assume they made almost 7800 Model G’s because that is how many frames they had left over from the government contract. The original price was $55. The gun was a commercial failure. Advertising for the G .380 was scanty at best--it was only mentioned, almost as an afterthought, in advertisements for other models, and never pictured. A brief review of the gun in the Dope Bag section of American Rifleman for September 1948 states that (at the time) it was the only gun being made in the U.S. that was chambered for the .380 cartridge. Hence .380 cartridges must have been relatively hard to find, and expensive, compared to .22 ammunition. According to Petty, High Standard eventually offered the G .380 to employees for only $15 and then sold the remaining stock to J.L. Galef, a retailer and importer of guns in New York City. 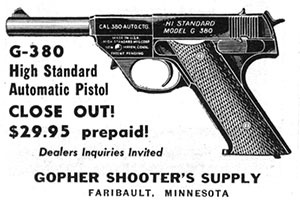 In late 1950 the G .380 was being advertised by a company in Minnesota for $29.95 and was still being offered at the same price in 1953. Even at a 45% discount, sales were not robust. The removable barrel design of the G series guns eliminated the need for the spring-loaded fold-down slide stop, which had always been a weak point. The higher pressures of center-fire cartridges required a much stronger slide stop and a design that did not allow the slide to come off the gun to the rear. With the fold-down slide stop eliminated, the G series pistols are a relatively simple design. The slide assembly includes the firing pin, recoil spring, and extractor. The frame contains the hammer, mainspring, and sear assembly at the rear, the trigger with its spring and plunger at the front, as well as the barrel release lever and spring. Other than that, there is only the connector bar with its small flat spring, the side plate, and the safety lever. The earlier High Standard pistol designs are complicated by the slide stop mechanism in the frame, with its concomitant spring, plunger, and release lever; and the slide itself is complicated by the button and spring that allow the recoil spring to be locked in compressed position, both of which require more parts and machining than the removable barrel design of the G series pistols. The parts list for the Model HB includes 63 parts, whereas that for the G .380 only includes 54. I have been unable to locate a schematic diagram for the G .380 pistol. In 2015 my son and I bought a G .380 pistol from a local man for $150. The price was low because the gun was rusted, badly pitted, and in need of refinishing. I photographed the pistol, field stripped it, and removed the grip plates. Once the left grip plate was removed I had access to the side plate. After the hammer was cocked, I was able to remove the safety lever, and the side plate came with it. Removal of the sideplate revealed the connector (referred to as the sear bar in the parts list), which is tensioned by a small flat spring. I took a close-up photograph of the connector and spring, then I removed them both. I considered for a time how much further I should disassemble the gun, but because the trigger and trigger pull pin were rusted I decided I needed to remove them along with the trigger spring and plunger. The pull pin had to be removed first from the top of the trigger, using a small hammer and punch, then I used a larger punch and hammer to remove the trigger pin. The barrel release catch also had some rust on it, so I decided to remove it and its spring as well. I decided not to remove the hammer or any parts of the hammer assembly, nor did I disassemble the slide. After disassembly my first task was to remove surface rust. I did this with a Dremel tool fitted with a brass brush wheel. This was a learning project for my son and I both, and we worked in tandem to polish the three major components, the barrel, slide, and frame. For this purpose we used emery cloth in 220, 320, 600, and 1500 grit; a 1750 RPM buffer with 6-inch buffing wheels; and a Dremel tool with various attachments for the small parts. For information on buffing and polishing I referred to a book I have by Bob Brownell, Gunsmith Kinks, which has an entire chapter on “Metal Polishing,” and an online reference entitled “How to Buff and Polish” from Caswell Incorporated which sells all sorts of equipment and supplies for metal finishing. For the deeply pitted side of the barrel and slide we started with a sisal wheel and a carborundum compound, then moved to a sewn cloth wheel with carborundum, followed by tripoli and then rouge. We weren’t able to take the deeply pitted parts down to perfect smoothness. Perhaps we weren’t patient enough, but we also didn’t want to lose the inscriptions on the left side of the gun . We spent an entire afternoon buffing the slide, barrel, and frame. For smaller parts we used the emery cloth, followed by buffing with a small buffing wheel on the Dremel tool. We followed the black carborundum compound with brown tripoli and white rouge, each on a separate buffing wheel. That ‘blueing’ was originally ‘browning’ is reflected in the French term ‘bronzage’ and the German terms ‘Brünieren’ and ‘Bronzieren.’ All are essentially a controlled rusting or oxidation of the surface of the metal, intended to reduce reflectivity and protect the metal surface from uncontrolled oxidation. A traditional rusting solution will cause the metal to turn light grey at first and eventually, with repeated applications, brown. 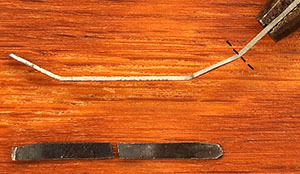 Between applications of the solution the metal is ‘scratched’ with a steel brush or steel wool. In order to get a blue or black color the metal is boiled or steamed between applications. The blueing and scratching (and boiling) operations are repeated a number of times, until the desired color is achieved. Today most blueing solutions involve the use of one or more acids mixed with various metal salts, usually used in large heated tanks. There are a number of quick ‘cold blue’ formulas, but most do not produce as high quality a finish as hot blueing. The best so-called cold blue I have found is Oxpho Blue, sold by Brownell’s Inc. As far back as 1969, a gunsmith wrote to Bob Brownell: ‘For the production job I use the hot tank method. But when I want a particularly fine job on either my own or customer’s guns, I use [Oxpho Blue].’ Brownell’s book, Gunsmith Kinks, gives basic information for using Oxpho Blue, and there are also a number of excellent videos to be found on YouTube. The thing that Brownell left out in 1969 was heat, which I find is essential even though it is called a “cold” blue. Oxpho Blue contains selenious acid, phosphoric acid, copper sulfate, and nickel sulfate. The rust-inhibiting properties of phosphoric acid are well known, so it is an ideal acid to use in a bluing solution. The copper and nickel salts produce the blue color. Oxpho Blue comes in two forms, a liquid and a thick paste. I bought both and have found them both useful. I reblued a little Baby Browning one time and I could swear that the paste gave me a better result, but when reblueing the Hi Standard G .380 we found that the liquid seemed to work better, so I think they are both worth having. In my experience, every piece of metal takes the color differently and different types of metal will give slightly different colors. Before we proceeded to blue our parts, we needed to clean them. With traditional blueing, cleaning the surfaces to be blued is essential, but with Oxpho Blue it is less critical because it will blue even through surface oil. Nevertheless, because our gun had many surfaces, inside and out, with old hardened oil and grease on them, we felt it was necessary to clean all the parts thoroughly in order to get a good result. There are various methods recommend for cleaning gun parts. I read somewhere long ago that you can soak the parts in lacquer thinner, and this worked well for me the first time I refinished a gun, but I found that I needed to start the blueing process right away because the parts started to rust almost immediately after drying (particularly in a humid environment). Brownell’s also makes a product called TCE Cleaner Degreaser Aerosol, which can be sprayed on, and I have found that this product also works well, but with the same caveat--it leaves the metal completely without protection from moisture. But, since I first tried these solvents for cleaning gun parts, a friend who is in the jewelry business gave me an ultrasonic cleaner: he had upgraded to a larger, better model. I filled the ultrasonic cleaner with an ammonia solution. Household ammonia traditionally comes in a concentrated solution, but what the grocery store carries now is considerably diluted and they often add a lemon scent to make it smell better. I used about one part of this already dilute ammonia solution to four parts water. The small parts, barrel, and slide were placed in a basket which was suspended in the solution and cleaned on high, with heat, for 40 minutes. The frame was suspended in the solution in such a manner that it did not touch the walls of the tank and was also cleaned for 40 minutes in a fresh heated solution. Once the parts were cleaned, we handled them with gloves only. This is essential with traditional blueing because any trace amounts of oil or grease from the hands will produce an uneven blue. It is less critical with Oxpho Blue, but because we intended to wear gloves for handling the blueing solutions anyway, we put on our gloves at this point and kept them on until we were finished. I recommend gloves anytime you are using blueing solutions, which almost all contain toxic heavy metals. The process followed was: heat with a heat gun so it’s hot to the touch but not so hot you can’t pick it up with gloves on (if it melts your gloves it’s too hot), apply solution, let sit for several minutes, scratch with steel wool until all mottling is removed, then repeat. Each part received approximately twenty applications before it reached the desired color. Brownell recommends 0 or 00 steel wool, but 0000 was what we had on hand, and it seemed to work fine. Toward the end we began to use less heat and to apply the paste form of the Oxpho blue with a soft cloth, as if it were a polishing compound. We rubbed the paste into the finish, then took a dry soft cloth and rubbed away any excess, burnishing the metal with the soft cloth. We finished by oiling the newly-blued surface thoroughly. The entire cleaning and blueing process took the two of us about six hours. We took the gun to the range to shoot it, but we found that it only fired intermittently. If we jiggled the trigger enough it would eventually fire. I removed the left grip plate and the side plate to examine the connector and quickly discovered that the spring tensioning the connector was too weak. I have no way of knowing if this was the original spring or not. I tried to bend it to increase the tension and it broke in half. I welcomed this as an opportunity to try my hand at making a spring, which is a traditional gunsmith activity. Gunsmith Kinks has a whole chapter on ‘Spring Making’ which I read with interest. I also found an article in the American Rifleman for February of 1960 (page 39) with some useful information. Finally, there is a lot of information on YouTube about making springs. In particular, I found a series of three videos by an old British master gunsmith, Jack Rowe, to be especially useful. The spring I needed to make was much smaller, but the process was essentially the same. The first thing I needed was some steel. I dug out my little-used micrometer and determined that the original spring was 19 thousandths of an inch thick. If I were a patient man I would have looked around in junk yards and friends’ garages until I found something the right thickness, which might have taken weeks or months, but instead I looked on Amazon.com where I found a listing for 1095 Spring Steel Sheet, .020” thick. It was a much larger piece than I needed (in fact I think I could make about 10,000 springs out of it) but I reasoned that I could write this article and then write the steel off as a business expense. Three days later I had the steel I needed. Of course, it is tempered steel, so I needed to remove the temper before I could do anything with it. With considerable difficulty I used a hacksaw to cut a small piece about 1.5 inches square. To take the temper off the steel, I needed to anneal it, which is to say I needed to heat it until it glows orange and then let it cool slowly. I tried using my little Bernzomatic propane torch on it, but it just wasn’t hot enough. Fortunately, I have a friend who makes jewelry and has a torch that uses propane and oxygen. I took my piece of steel to his workshop where it took less than ten seconds in the flame to have my sheet steel glowing orange. I let it cool until I could pick it up with my fingers, then used his little German microsaw and metal jig to saw four pieces about 1 millimeter wide and maybe 30 millimeters long. I don’t think I could have done it without my friend’s specialized jewelry-making equipment. Using the connector bar and the old spring as a guide, I bent the pieces of metal in the right places, leaving an extra tab of metal on the end to grasp it by. I used a micro file and 320 grit emery paper to smooth off the rough edges. Then I pinched the tab at the end in a pair of needlenose pliers, heated my spring-to-be to glowing orange, and quenched it in a plastic spray cap filled with oil. Jack Rowe recommended then lighting the oil remaining on the spring, letting it burn off, then dunking it again in the oil and burning it off again, so I followed his procedure. Then I used the microsaw to saw the tab off the end of the spring, and used the microfile to smooth the end where I had made the cut. When I inserted the spring into the gun it fit perfectly, and the connector was properly tensioned. The gun now functions correctly. I might have been able to use a spring from an H-D Military or a Model G, as all the Hi-Standards have a similar spring in this location, but I have a sense of accomplishment for having successfully made a spring. The trigger is not the best, but far from the worst I have tried. It has a short travel and breaks cleanly, but at about six pounds. For target shooting I would prefer something closer to two-and-one-half or three pounds. The front sight is relatively thin, but the rear sight has a wide notch, so there is a lot of daylight on either side--not exactly target sights. With a full magazine, I found it almost impossible to get the magazine seated so that it latches properly. I resorted to loading only four rounds at a time. 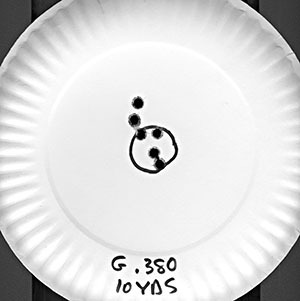 The G .380 fed hardball ammunition with no problems. I had an occasional problem with hollow point ammo chambering properly, but I was using very cheap ammunition that causes that problem with a lot of guns. The gun is more accurate than I am. At my age I can see the front sight clearly, or I can see the target clearly, but not both. Make sure the chamber is empty and remove the magazine. Push the barrel release lever up and draw the barrel off the front of the gun. Draw the slide off the front of the gun. Angier, R.H., Firearm Blueing and Browning. Arms & Armour Press, London: 1936. Brownell, F.R., Gunsmith Kinks. F. Brownell & Son, Pub., Montezuma, Iowa: 1969. Caswell, Inc., How to Buff and Polish. Eger, Chris, “The High Standard HD 22 Pistol: Dirty deeds, done dirt cheap.” Guns.com, 23 February, 2013. Miller, Jon, “High Standard Guns of World War II.” Small Arms Defense Journal, 23 August, 2011. Petty, Charles E., High Standard Automatic Pistols: 1932-1950. American Ordnance Publications, Charlotte, North Carolina: 1976. John Stimson’s High Standard Data. “C.G. Swebilius Dies.” American Rifleman, January 1949, p. 52. Copyright 2016 by Ed Buffaloe. All rights reserved.